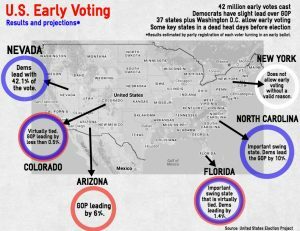 U.S. early voting results and predictions. Graphic by Maggie Parkhill. Early polls closed this past weekend, and estimates show Democrat Hillary Clinton with an advantage in the presidential race over Republican Donald Trump, even though neither has yet clinched the 270 electoral college votes needed to take the White House. New York State only allows early votes to be cast in extraordinary circumstances, but millions of other voters from around the country have already cast their vote for president. Over 42 million votes have already been cast in 37 other states, just shy of the 46 million early votes cast in the 2012 presidential election. While overall early voter turnout is down, key swing states such as Florida and North Carolina have seen increases in early ballots turned in. Those tracking early voting have said that registered Democrats have slightly outnumbered registered Republicans in turned-in early ballots, which presumably gives Hillary Clinton a lead in the early voting. One of the most contested battlegrounds is Florida, where the two traditional parties are in a dead heat according to early voting statistics. Florida has in the past been a key swing state, which is likely what brought Clinton there on Saturday to campaign and visit two early voting sites. Colorado is also a tight race, with GOP voters leading the Democrats by less than 0.5 of a percentage point. At this point in 2012, the GOP had a slightly more comfortable two per cent lead.